Onkyo TX-NR1009 review | What Hi-Fi? 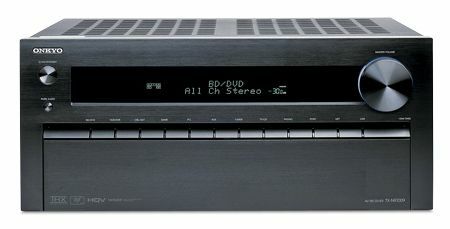 The battle for AV amp supremacy is brutal at around the £1000 mark, but history and previous form suggests that if there’s one company that can hold its own, it’s Onkyo. On paper, the TX-NR1009 looks like it has all the credentials of a top receiver. The subtle, smooth-fronted design is, dare we say, attractive compared to Onkyos of old, and the amp feels sufficiently sturdy. The inclusion of Dolby Pro-Logic IIz, Audyssey DSX and DTS Neo:X means front height, width and surround back speakers can be used in variety of configurations, with nine channels of amplification and two subwoofer outputs to choose from. Seven HDMI inputs lurk around the back, while a front-mounted HDMI socket will come in useful for cameras, camcorders, and other HDMI-equipped peripherals. Internet connectivity opens up a raft of online services such as Napster, Last.fm vTuner internet radio, while Spotify Premium subscribers can also stream their favourite tracks and search for new ones. High-tech video processing from HQV is included and you can calibrate the picture for each source. The Onkyo does a good job upscaling a standard-def TV or DVD feed. But it’s sound quality where the Onkyo really earns its stripes, producing a muscular yet expertly controlled sound that works well with The A-Team’s bombastic audio. On the flipside, there’s also a sprinkling of subtlety and finesse that helps to bring the best out of more delicate movie soundtracks. a worry for the current class-leaders.